Moosebutter is a four-man comedy a cappella group. 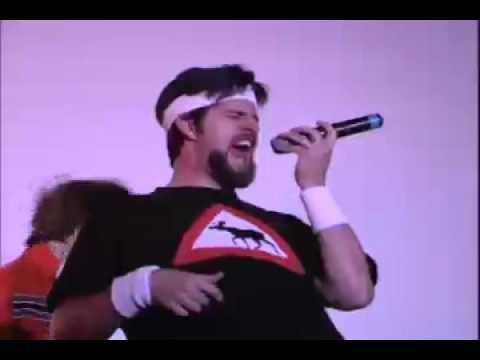 They have won awards from the Contemporary A Cappella Society(Best Comedy Song, 2004), The Harmony Sweepstakes (2003 International Finals runners-up), had their music included on compilation albums (Doctor Demento Basement Tapes 2005, Sing II 2005) and played live shows in front of audiences around the United States. Their tight harmony and eclectic humor have charmed audiences through two albums and countless live performances. To handle all the performance requests they receive, moosebutter has several casts of performers. They perform with three, four, or five singers, depending on the show, and have done just about every kind of show you can imagine (Punk rock show? Check. National television? Check. Wedding reception? Check.). Winners of multiple internation awards, including Harmony Sweepstakes international finals runners-up and Contemporary A Cappella Recording Awards Best Comedy Song. 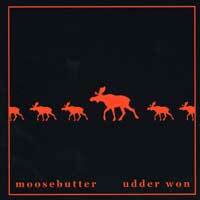 moosebutter has entertained audiences across the United States since 1999. We had the pleasure of seeing the manic four young men of Utah-based Moosebutter at the recent smash West Coast Summit, first in a showcase concert at Dominican College, and then, by invitation because they were so hilarious, at the Saturday night concert. There are 4 authentic young comic geniuses here, especially Tim Y. Jones, who writes, composes, adapts and arranges practically everything in this CD. There are 17 little delights here, from an ode to tile, "The Happy Tile Cleaner," "Captain Organic Vegetable Man," "Psycho: The Musical," "The Alphabet Song," the amazing "Star Wars Medley" adds words to those deathless heroic theme songs, like "Kiss a Wookiee, kick a droid, fly the Falcon through an asteroid, 'til the Princess gets annoyed," "Ghost Chickens in the Sky," the very funny "Cell Phone," "The Googies," "O Pretty Baby," "Luck o' the Irish," "Turkey Dance," "Jell-O," "He Met Her on the Stairs" and "Spew." This is funny, brilliant stuff, that wowed 'em at the Summit, with crazed sound effect samples, the kind of material that gets a group on morning shows and stages at the Harmony Sweeps Finals! There they were, 4 young guys from Utah at one of the daytime West Coast Summit "showcase concerts," in white headbands, red polyester running pants and black windbreakers, singing "Captain Organic Vegetable Man" and "Star Wars." That night they were invited to do some of their set at the big Summit concert at Marin Veterans Auditorium, and the crowd went nuts. Segue to May, 2003, another Saturday night on the same stage--the Harmony Sweeps Finals, where Moosebutter came in second only because The Idea of North could have beaten a choir of angels that night. Although they're not our type, we loved Moosebutter from the beginning, and have played their 1st CD, "See Dee," until "Psycho, the Musical" sounds like Alvin & the Chipmunks. Their long-awaited 2nd CD, "udder won" is now safely installed in our boombox. 15 manic songs, like "Uncle Earl's Hairpiece," the deeply romantic "The Valentine's Day Song," "Harry Potter" (sung to the tune of Roy Orbison's "Pretty Woman"), "I Hate Mosquitoes," "Rubber Monkey," "Hicksville, parts 1 and 2," "Jon Boy Jon," a particularly crazed "Witch Doctor" and the never-ending "Squirrels" (In My Nose). "Udder won" (which we think refers to the fact that they had one "See Dee" and this, obviously, is the "udder won"), is funny, bizarre, weird, brilliant and totally bananas. Our theory centers on something in the Utah water, and we'll take a six-pack!